The U.S. housing market continues its slow but steady recovery, with building permits filed in April rising to the highest level since 2007. According to new data from the U.S. Census Bureau, building permits for private-housing units in April reached a seasonally adjusted, annualized total of 1,143,000. This is 10.1 percent higher than the 1,038,000 recorded in March and 6.4 percent above the April 2014 level of 1,059,000. While these numbers are encouraging, the recovery is far from complete. Residential construction plummeted in the aftermath of the 2007 mortgage crisis, and stayed at historically low levels through 2011 (see chart above). 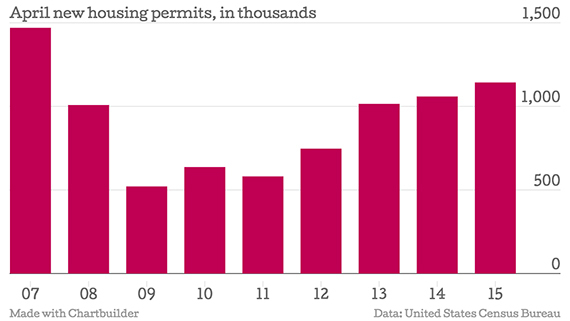 The market has since recovered, but permits are still well below their average from the 1990s and early 2000s. Between January 1994 and September 2007, the number of building permits never fell below 1.2 million and was above 2 million almost every month from 2004 to 2006. “I think we still have a ways to go (in the recovery),” said Sam Chandan, chief economist at Chandan Economics. He explained that much of the growth in permits is coming not from single-family homes, but from multifamily housing. In other words: more units are being built today, but they are on average smaller and many of them are rentals. “That does not suggest a balance in the housing market,” Chandan added. Compared to the national market, residential construction in New York City dropped much more precipitously during the crisis, but has also rebounded more strongly since (see chart above). In 2014, the Department of Buildings authorized the construction of 21,478 new residential units, according to NYU’s Furman Center. This is still below the levels of 2007 and 2008, but well above the 2010 low of 1,647. 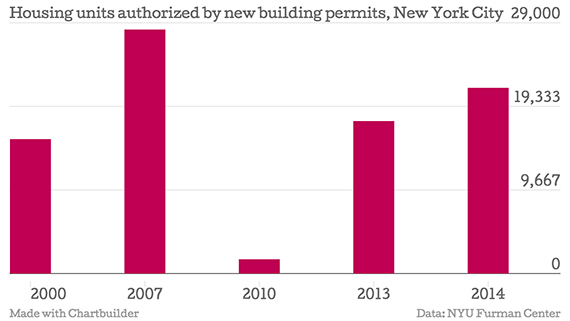 And unlike the U.S. as a whole, New York City is now issuing more residential building permits than it did in the early 2000s.